Over 75 Sleepwear Items Under $20! Macy’s Fashion Directors have come up with a list of Spring’s must haves and today it’s time to share what all the stylish men on the street will be wearing once the weather warms up. The Khaki Suit: It’s this season’s go-to when the mercury starts to rise. Whether paired with a tonal shirt and tie or a white tee and sneakers, this is warm weather dressing made easy. The Chino: This season, the chino has been re-engineered with stretch and performance capabilities, a trimmer fit and weathered shades of color. The Loafer: Consider showing a little ankle when wearing this season’s coolest shoe trend, the loafer. It works as effortlessly with a khaki suit as it does with jeans and a button down collar shirt, creating the ideal balance between polished and casual. The Button Down: A classic menswear staple returns to our list of must-haves. The button down collar shirt is updated for spring with fabrics that stretch and breathe. Embrace the refreshing range of color! The Striped Tee: When the mood says spring and the skies indicate otherwise, layering the striped tee under your favorite woven shirt, blazer or coat creates an Instagram worthy snapshot of warmer days ahead. The Slicker: When it’s too warm for a coat, but too cool or wet without an extra layer, the slicker is the go-to outerwear of choice. This is the essential layering piece and new this season is a wide range of colors and prints, including floral, camouflage and stripes. Thanks to MBlog for the great men’s fashion advice. 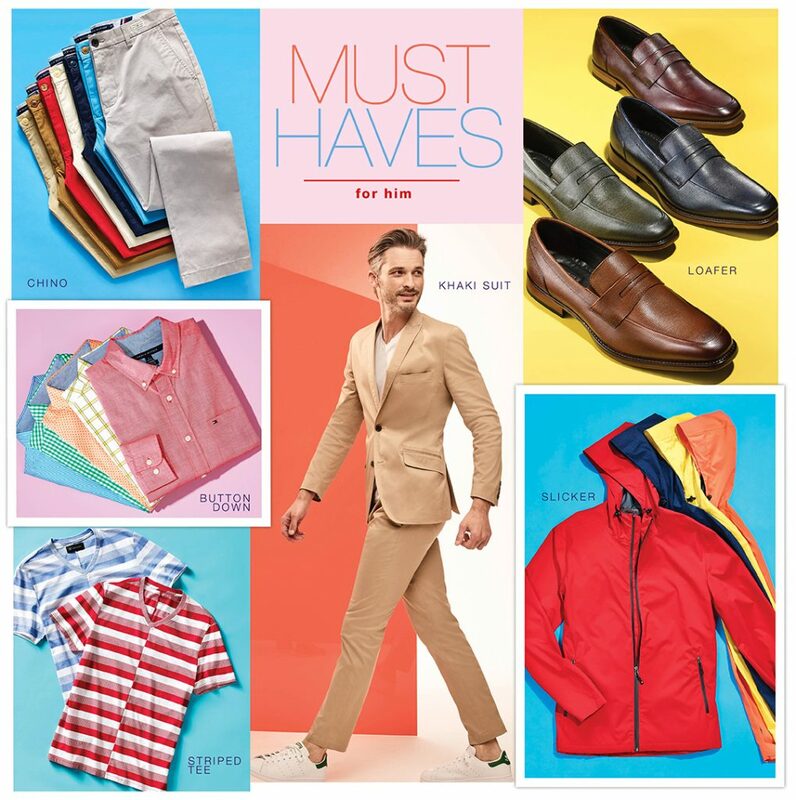 Don’t forget to shop for these “Spring Must Haves for Him” at Macys.com!